Andy Pohl hopes to be a resource for those wanting to take advantage of advanced computing. 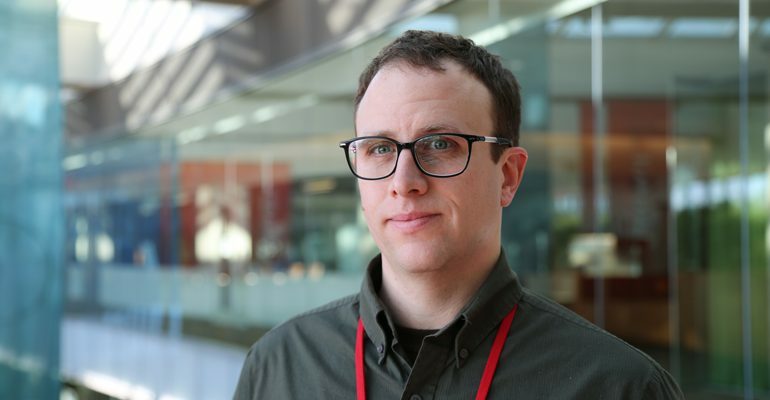 As a Morgridge Postdoctoral Fellow, Pohl will facilitate a collaboration between the Morgridge Institute’s Core Computational Technologies (CCT) team, led by director Miron Livny, and UW-Madison’s Waisman Center, a facility led by interim director Albee Messing that specializes in the study of intellectual and developmental disabilities. The Waisman Center encompasses a diverse group of researchers in more than 25 affiliated UW-Madison departments, from geneticists and stem cell researchers to behavioral and social scientists. Pohl isn’t certain how many of the groups will take advantage of his role as a computing facilitator, but he says the researchers working with brain scans are already using the advanced computing resources frequently. Brain imaging is a good example of something that’s almost always considered big data. Throughout his academic career, Pohl transitioned from computer science to bioinformatics to biomedicine. When studying computer science as an undergraduate student at UW-Madison, Pohl initially thought he would become a programmer at a bank like one of his relatives. It was a summer job working in the biostatistics department that exposed him to biological research and led him to a graduate program in bioinformatics at University of California, Santa Cruz, where he got a master’s degree. Cue a biomedicine doctoral program in Barcelona, Spain. During this time, Pohl studied chromatin and gene regulation in a specific breast cancer cell line and developed open-source bioinformatics software. Armed with a unique set of skills encompassing both computer science and biological fields, Pohl has returned to Madison to help scientists realize the full potential of their current computational strategies and showcase additional resources. Pohl says he thinks having an understanding of both computer science and biological approaches to research will enhance his capabilities as a research computing facilitator and potentially encourage further interdisciplinary collaborations.